Figuur 3.2. A screenshot illustrating the multi-window mode. Dialog and dock managing is described in Paragraaf 2.3, “Koppelen van dialoogvensters”. Figuur 3.3. A screenshot illustrating the single-window mode. When several images are open, a new bar appears above the image window, with a tab for every image. You can navigate between images by clicking on tabs or either using Ctrl+Page Up or Page Down or Alt+Number. “Number” is tab number; you must use the number keys of the upper line of your keyboard, not that of keypad (Alt-shift necessary for some national keyboards). If your GIMP layout is lost, your arrangement is easy to recover using Windows → Recently Closed Docks ; the Windows menu command is only available while an image is open. To add, close, or detach a tab from a dock, click in the upper right corner of a dialog. This opens the Tab menu. Select Add Tab, Close Tab , or Detach Tab. 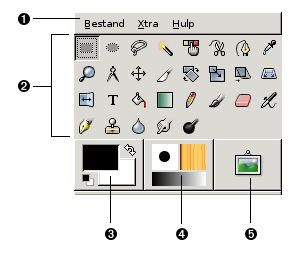 The following sections walk you through the components of each of the windows shown in the screenshot, explaining what they are and how they work. 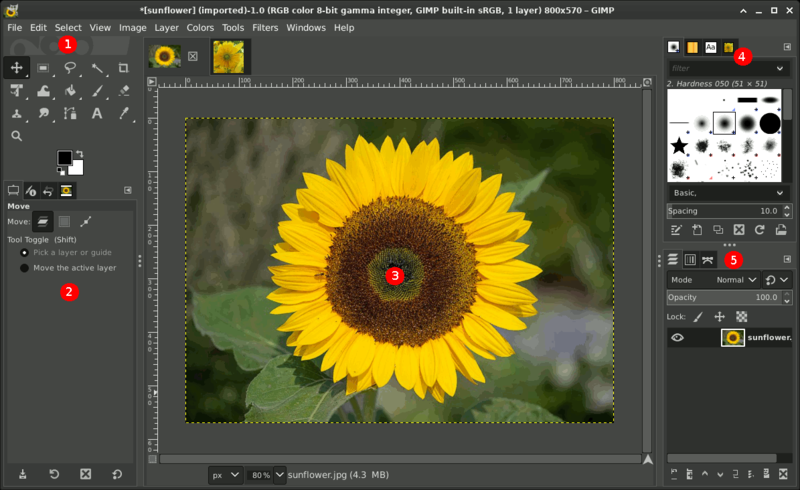 Once you have read them, plus the section describing the basic structure of GIMP images, you should have learned enough to use GIMP for a wide variety of basic image manipulations. You can then look through the rest of the manual at your leisure (or just experiment) to learn the almost limitless number of more subtle and specialized things that are possible. Have fun! The Toolbox is the heart of GIMP. Here is a quick tour of what you will find there. In the Toolbox, as in most parts of GIMP, moving the mouse over something and letting it rest for a moment, usually displays a “tooltip” that describes the thing. Short cut keys are also frequently shown in the tooltip. In many cases, you can hover the mouse over an item and press the F1 key to get help about the thing that is underneath the mouse. By default, only the Foreground-background icon is visible. You can add Brush-Pattern-Gradient icons and Active Image icon through Edit → Preferences → Toolbox: Tools configuration. Tool icons: These icons are buttons which activate tools for a wide variety of purposes: selecting parts of images, painting an image, transforming an image, etc. Paragraaf 1, “Het gereedschapsvenster” gives an overview of how to work with tools, and each tool is described systematically in the Tools chapter. Foreground/Background colors: The color areas here show you GIMP's current foreground and background colors, which come into play in many operations. Clicking on either one of them brings up a color selector dialog that allows you to change to a different color. Clicking on the double-headed arrow swaps the two colors, and clicking on the small symbol in the lower left corner resets them to black and white. Brush/Pattern/Gradient: The symbols here show you GIMP's current selections for: the Paintbrush, used by all tools that allow you to paint on the image (“painting” includes operations like erasing and smudging, by the way); for the Pattern, which is used in filling selected areas of an image; and for the Gradient, which comes into play whenever an operation requires a smoothly varying range of colors. Clicking on any of these symbols brings up a dialog window that allows you to change it. Active Image: In GIMP, you can work with many images at once, but at any given moment, only one image is the “active image”. Here you find a small iconic representation of the active image. Click the icon to display a dialog with a list of the currently open images, click an image in the dialog to make it active. Usually, you click an image window in multi-window mode, or an image tab in single-window mode, to make it the active image. You can “Drop to an XDS file manager to save the image”. XDS is an acronym for “X Direct Save Protocol”: an additional feature for the X Window System graphical user interface for Unix-like operating systems. 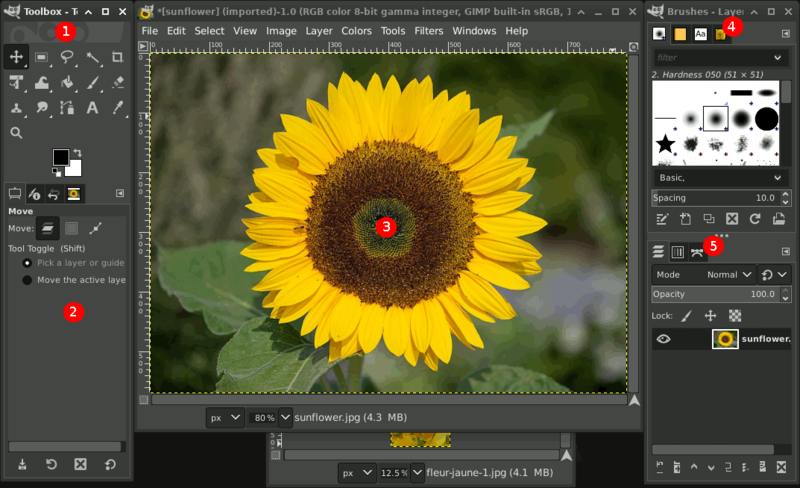 At every start, GIMP selects a tool (the brush), a color, a brush and a pattern by default, always the same. If you want GIMP to select the last tool, color, brush and pattern you used when quitting your previous session, check the Save input device settings on exit in Preferences/Input Devices. The Toolbox window displays “Wilber's eyes” along the top of the dialog. You can get rid of the “Wilber's eyes” by adding the following line to your gimprc file: (toolbox-wilber no). It only affects the toolbox. The eyes in the Image window are only visible when you do not have an open image.